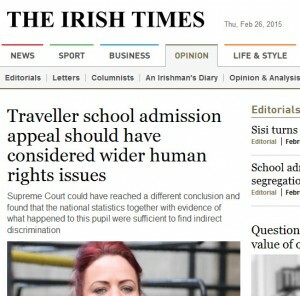 I have written a short piece for the Irish Times concerning school admissions and the Equal Status Act. The article has been published here. I may in due course develop this into a longer article for a journal in which I can provide evidence for each aspect, and tease out the issues in more depth. The Supreme Court case is Stokes v Christian Brothers High School  IESC 13. My article only discusses the main judgment in the case, agreed by three judges. It does not discuss the other judgment in the case, in which two judges found that the Supreme Court did not have jurisdiction to hear an appeal in a case such as this. The Equality Authority appeared as amicus curiae in this case. See the press release of the Irish Human Rights and Equality Commission (which replaces the Equality Authority). Aisling Twomey writes in the Irish Examiner about how travellers would thrive if they were given the opportunity. 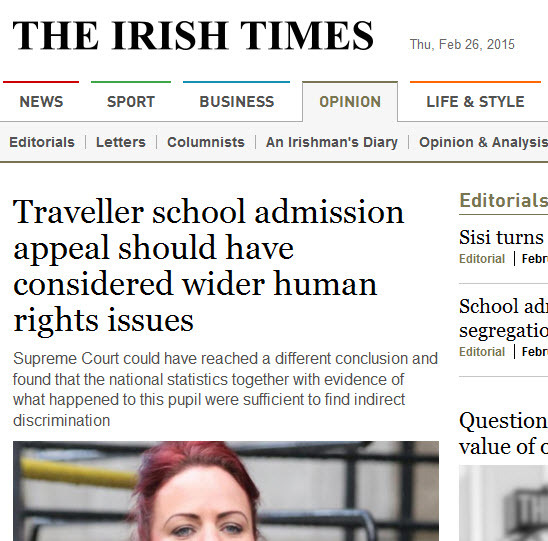 I previously posted on travellers in County Clare and the Equal Status Act. What happens the detainees when the War on Terrorism ends? University of Pittsburghâ€™s excellent JURIST blog today reports on a draft bill before the Iraqi parliament which would allow for the release of approximately 5,000 current detainees in Iraq and provide those released with an amnesty. Although there are some quite severe difficulties with the Bill â€“ not least the fact that excludes from its provisions all those in US custody and those imprisoned for, inter alia, adultery and homosexuality â€“ and the fact that it is not targeted as a response to terrorism-related detentions, the Billâ€™s presentation does raise an important question: what will â€˜weâ€™ do with those detained on suspicion of terrorist activities when the â€˜War on Terrorismâ€™ ends? Accordingly, the democratic French, who had greatly contributed to the theory and practice of human rights, committed torture. And because the French had tortured, they could not put their enemies on trial; instead, they summarily executed them. Their efforts to sweep these atrocities under the rug for many years led to the loss of their self-respect, as well as the respect of many others, starting with the Arab-Islamic world. Torture may have helped the French win the battle of Algiers, but their policy of abuse led to many negatives, including increased domestic criticism and loss of reputation in the world; meanwhile their enemies failed to lessen their struggle. The Bush policy toward enemy detainees replicates much of this French experience. US nationalism after 11 September 2001 has been less intolerant than some periods in US history; the Wilson and McCarthy eras quickly come to mind. But perhaps that is due to the lack of open, vigorous debate and dissent about Bushâ€™s security policies. Given this lack of serious domestic debate, the Bush Administration has been able to sustain its policy of abusive interrogation, even if it has had to clean up detention practices in military facilities. International criticism has been much less important than domestic factors, although the role of the ICRC is not without importance. The situation is not totally new, not only by comparison to France in Algeria. During the Cold War, the United States then too spoke of freedom and human rights and the rule of law but acted in the shadows to overthrow elected governments and back murderous allies, as in Chile and Guatemala. But to paraphrase Satre in the earlier quote, why should Americans go to such trouble to be patriots if their country in reality stands for torture and other serious violations of fundamental human rights? The French have much to say on the subject. A law such as that proposed in Iraq is unlikely to solve the problems to be faced by the United States at the â€˜cessation of hostilitiesâ€™ when even its (shaky) IHL grounds for detention are gone, but it may well become time to start thinking about strategy. Although the candidates for presidential nominations from both the GOP and the Democratic party have address Guantanamo and the â€˜War on Terrorismâ€™ (for a useful summary of GOP hopefuls’ approaches see here), none appear to have come up with a sustained strategy to avoid a repetition of what Forsyth might call â€˜the French lessonâ€™. The US District Court for Eastern New York has held that human rights organisations have an equivalent right to protect their sources to that enjoyed by journalists. The case concerned an Amnesty International report in which lawyers â€“ quoted anonymously â€“ expressed concerns that their meetings with clients at a federal jail were being secretly videotaped. The Court held that Amnesty was not obliged to reveal its sources. The decision is an important one â€“ important enough to perhaps be litigated further and to higher federal courts â€“ because human rights organisations such as Amnesty, Human Rights First and Human Rights Watch (for example) frequently rely on victims and others for their reports, while those from whom testimonials are taken rely on anonymity for their safety. The Brussels-based Magna Carta Institute – a self-described “not-for-profit Brussels-based independent research institute, university spin-off and academic network specializing in human rights and international law” – has advertised its internship programmes for 2008 including internships in human rights and terrorism, human rights and business law, the history of international law and international relations, and region-specific human rights issues. Full details of the internships are available here. US State Department Legal Advisor John Bellinger has called on the international community to â€˜clarifyâ€™ the contents and scope of application of the Geneva Conventions (International Herald Tribune). In an address to reporters at the ICRC annual meeting, Bellinger claimed that the Conventions apply to conflicts between states and thus do not offer guidance as to how long one can hold people in conflicts with non-state actors. The view does seem somewhat at odds with the position of the US Supreme Court expressed in the Hamdan decision that Common Article 3 of the Conventions â€“ applying to â€˜non-international armed conflictsâ€™ â€“ could apply to conflicts between states and non-state actors (although itâ€™s not necessarily the case that this is correct or that the court was sufficiently rigorous in its application of IHL: see Fionnuala Ni Aolainâ€™s insightful critique in the Minnesota Law Review). More interesting, however, is Bellingerâ€™s contention that â€œ[t]he United States is firmly committed to the law that applies. We’re also committed to working with other countries around the world to develop new legal norms in cases where existing law does not give one the answers. But what we do think is problematic is to simply suggest that the Geneva Conventions provide all of the answers in fighting international terrorism, and that countries simply need to follow the Geneva Conventions and that is the end of the matterâ€. This appears to suggest that there is no law to govern detention of suspected terrorists, when in fact there clearly is: international human rights law. Nobody suggests that the application of the Geneva Conventions is the end of the matter. The ICJ (in the Advisory Opinion on Nuclear Weapons) and many commentators have noted that international human rights law continues to apply in parallel with and through the prism of international humanitarian law. The United States, however, predominantly takes the position that IHRL does not apply in times of IHL-application. The root of the problem arguably lies not in deficiencies within the international legal code, but rather in the restricted view of applicable law on the part of the US authorities.